Picture this: you’ve successfully navigated the career fair, researching employers, dressing as a professional, and conveying confidence (see Part 1 – The Career Fair). You even got contact information for follow up and have since made that connection. After all your efforts, you receive an email or phone call requesting time for a phone interview. Congratulations! The phone interview can be something that isn’t given the preparation it deserves. After all, it’s just a phone call, right? You talk, text, instant message, tweet, and Facebook all day long with friends. How hard could it be? Free Yourself from Distraction – Find a quiet place away from outside noise such as dogs barking, traffic, television/radio, etc. Nothing is worse than trying to interview a candidate while a car alarm is going off in the background or while what sounds like a frat party is happening in your house. Dress and Sound the Part – Would it be easier to sound the part if you dressed for it (think pajamas vs. suit)? Opinions vary on this, but many feel that they would have a more professional tone just by wearing what they would during a face to face interview. Bonus tip: smile when you answer the phone – you’ll come across as happy, energetic and will set the tone for the entire interview. Watch your “um’s”, “uh’s”, “you-know’s”, and “like’s”. Answer and Ask Questions – Answer each question asked. Don’t make up something just to sound smart – they’ll know when you’re doing this. Also, don’t forget to have questions of your own to ask when the time comes. Know some sample interview questions for both the interviewer and interviewee. Practice the interview with a friend or family member before the phone call. Write It Down – Make sure you have a pen and notepad handy. You’ll want to write out notes during the call as you learn more about the specific opportunity. At the end, ask how you need to follow up and get their information. Follow Up – Ask the interviewer what the timeline is for this position. How soon should this position be filled? Would it be appropriate to follow up in a week? These are great questions to ask that will show that you’re serious about the job. Respect the timeline they give you. 15 emails/phone calls in follow up comes off as desperate. Most times, the hiring process takes longer than expected, so give a little extra buffer, following up a second time if no word is received by the time mentioned. Don’t forget to send a handwritten thank you note, if possible. Believe me, you’ll stand out by doing this. Please feel free to share these tips with your friends, colleagues, classmates, and any other jobseekers out there that need help with a competitive advantage. Next week, part three of this four-part series, Landing Your Dream Job, will be available. Part 3 – The Face to Face Interview will highlight the different styles of interviewing and some tips on making a positive impression. Subscribe to my blog to be the first to know when a new post is available. As always, thanks for reading. The point about dressing the part is important. Because the phone interview is used as a screening tool, you want to make sure that you consider it your first interview. 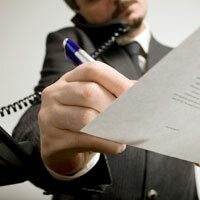 There are times, that you may speak with 3 or 4 interviewers over the phone before you are called in for a face-to-face. If you are “dressed” for your day of job searching, you will react more professionally over the phone, as if you were trying to “close the deal” by phone. Smile – while you are interviewing as well as when you are leaving your voice mail incoming and outgoing messages. I have to say, every time I come to campustocareer.wordpress.com you have another exciting post up. A friend of mine was telling me about this topic a few weeks ago, so I think I will send them the url here and see what they say. Thanks! I’m glad that you find the information useful. Please feel free to share the link with anyone who is searching for a job, those that have jobs, and even current students. I appreciate the feedback!